If all goes well I’m going to be making the call later this week. For the folks in Ontario - who is your T insured with? Hagerty insurance is who I use. No appraisal needed just give them the value you want it insured for. Don't go thru your broker call hagerty direct and save the $60 dollar broker fee. Hagerty is who I have all old cars and bike with. Hassle free. Never had a claim. Hope thats hassle free also. I figured Hagerty was the big one to go with, just thought I’d ask in case there was someone lesser-known but better. Thanks guys! Does Hagerty insure in Canada??? Yes Hagerty insures in Canada. I've always insured me car with them. Sorry for the typo. Gas fumes must be getting to me tonight. 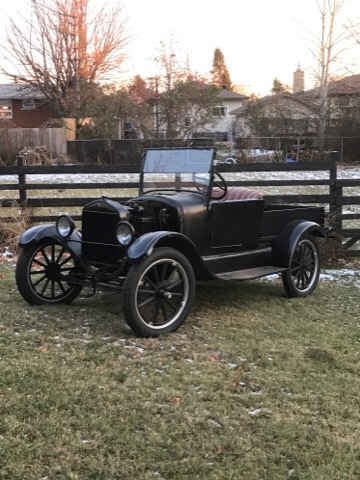 Leaky T.
Also on the subject of insurance, what do you figure my declared value should be on my cut-off ‘26? I was thinking if it got stolen or totalled maybe $6-7k would get me most of the way to another one. Does that sound about right? I use the National Corvette Museum for my insurance. They insure many types of cars, not just Corvettes. The folks on the Corvette Forums rate them very highly. Most insurance companies are good-- until it comes to paying your claim. Ask about their track record. Don't ask them. Hagerty was very good about paying claims when I used them. Someone hit our BMW M roadster rear bumper when it was parked. Hagerty just said e-mail us some photos and we will send a check. When my Corvette Z06 was rear ended I contacted Hagerty. I took it to the place of my choosing and they gave Hagerty the estimate. Hagerty paid with no questions asked. When additional damage was found they again paid with no questions asked. The total bill was about $ 18,000.00. Tim, I valued the 18 Runabout here at 10,000 with Hagerty. 200 bucks (US) a year for full coverage. For a laugh, see that PhsychOdelic 18 in my profile. Got it that way. :-) Do check your regular insurance folks too. Thanks to all for the suggestions, I ended up going with Hagerty. Got the whole thing done over the phone in less than ten minutes and it’s under $250 (Canadian) per year. The insurance topic comes up all the time. For those keeping an eye on the posts here, remember, it's not about how much your insurance costs, it's about what happens when you have a claim. I've been with J.C. Taylor forever and they are 1st class all the way. I've heard Hagerty is good also. Both companies support the hobby and that's big for me. I've known several who have had claims with J.C. Taylor and their customer service is tops. The major specialty insurers are going to be best in all categories, so Tim's choice to go with one of the antique auto specialty companies is a good one. J C Taylor handed my fire claim with no hassle. Send adjuster and check right out. Good folks to do business with. In my opinion, I would have an appraisal done. This way there is no wiggle room for them if something were to happen. While on the topic, does anyone know of a specialty insurance company that will insure drivers with less than 10 years of driving experience? Hagerty's underwriter in Canada, Aviva, has this stipulation. However in the US you can get specialty insurance at 15 or 16. This means my kids cannot insure through Hagerty until they are at least 26! Makes no sense to me! The whole basic for Cheaper rates for antique / classic cars is reduced exposure to claim situations. Adult Driver.Garage kept.not a daily driver. My carrier is Classic and they require You have a separate newer daily driver for you and one for Your spouse after that they will insure all the old cars You have at very cheap rates. Having survived two Son's during the learning to drive years back in the 80s One totaled two cars spent months in rehab survived.